Speaking with Fortune at the Brainstorm Tech conference in Aspen, Colo., Mollenkopf said the Apple litigation is similar in scope to past legal battles involving IP and component pricing. "At its core, it's really about the price of IP and what to pay for the technology that essentially Qualcomm and others — but in this case Qualcomm — really produced in order to invent the industry that I think [has] really become so disruptive and such an important force in our daily lives," Mollenkopf said. "But in reality, if you strip it all away, it's really about — we have a contract and people want to pay less under the contract and there's a lot of worldwide maneuvering to try to get that resolved." 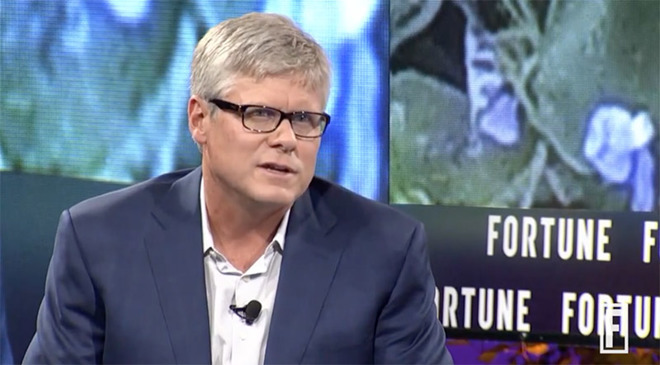 He added that Qualcomm's contract with Apple has been in existence "for a long time" and "there's not anything new going on," suggesting the litigation is a play for better price positioning. He went on to compare the ongoing Apple fight with a case that took place in the 2000s. While Mollenkopf failed to provide details, he was likely referencing Qualcomm Inc. v. Broadcom Corp., a series of patent infringement lawsuits over cellular technology lodged with a U.S. district court and the ITC, as well as European and Korean regulatory agencies. In 2009, Qualcomm agreed to end the litigation by paying Broadcom a $891 million out of court settlement. Mollenkopf on Monday said he expects the Apple action to end in a similar manner. "Those things tend to get resolved out of court and there's no reason why I wouldn't expect that to be the case here, although I don't have an announcement or anything so please don't ask," he said. "But that's really the way that it works." Mollenkopf's comments come over one week after Qualcomm announced plans to file a U.S. International Trade Commission complaint that would block the import and domestic sale of iPhone and iPad models that do not contain Qualcomm chips. To coincide with the ITC filing, the chipmaker lodged a lawsuit claiming Apple's devices infringe on six patents. Apple initially filed suit against Qualcomm in January, claiming the firm abused its "monopoly power" of the wireless modem industry to demand excessive royalties while at the same time forcing buyers to license patents. Further, the suit claims Qualcomm withheld almost $1 billion in rebates in retaliation for Apple's willing participation in a South Korean antitrust investigation. Qualcomm counter-sued in April, claiming Apple is in breach of contract. The firm has since asked courts to force Apple contract suppliers who stopped paying royalties earlier this year to continue payments. Apple previously relied solely on Qualcomm modems in its iPhone and iPad lines, a supply decision that resulted in a windfall of revenue for the chipmaker. Qualcomm's royalty rates, which are also at issue in Apple's lawsuits, are calculated based on whole device value, not per-component. With the iPhone 7, however, Apple diversified sourcing to include modems made by Intel. The tech giant is rumored to escalate the process by deploying Intel chips in about half of all iPhones made in 2017.